Joe Biagini has moved from his role as bullpen stalwart to the Jays rotation and has filled Aaron Sanchez’s starting spot admirably. While the wins seem to be eluding him, Biagini is racking up the strikeouts, keeping the runs to a minimum, and looking every bit like a Major League starting pitcher. So back to the topic at hand – Biagini is going to blow away his career inning total this season if he stays in the rotation. Tom Verducci is probably just cackling away, eagerly awaiting the moment when poor Joe’s arm flies off because he passes the dreaded 30% innings increase. I am here to tell you; do not worry about Joe Biagini’s workload. Everything is going to be fine. Innings pitched alone is an ineffective method of determining if a pitcher is at a high risk of getting injured. Overall pitch counts don’t really do the job either. Taking you back a bit to some of my previous work, I came up with a metric called “Fatigue Units”. This incorporates the work from other researchers to produce a metric that includes known risk factors for injury – such as days rest between appearances, fastball velocity, pitches per inning, and the total innings pitched in a season. Using this analysis method, fatigue units were a more effective approach identifying workloads that lead to UCL reconstructions in subsequent seasons than were innings pitched. So, what do Joe Biagini’s 2017 and 2016 workloads look like? Figure 1. 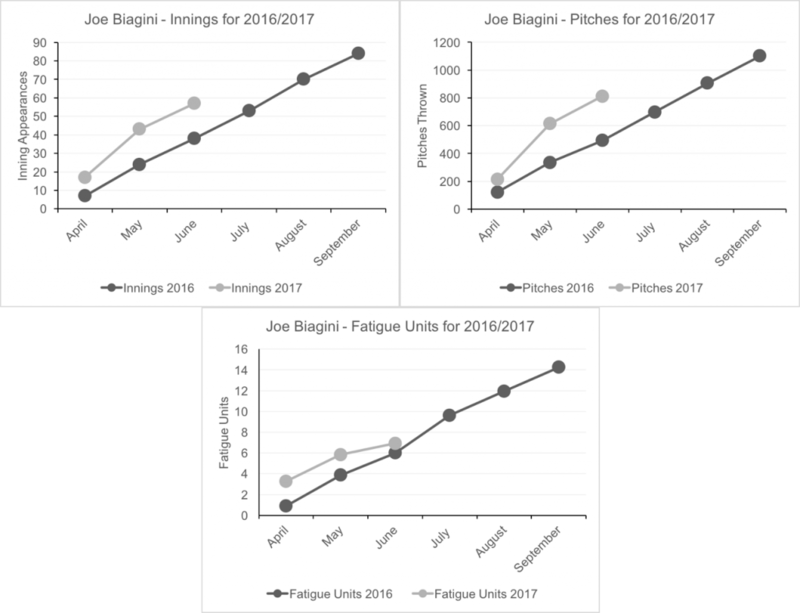 Various Workload Metrics for Joe Biagini during the 2016, and 2017 seasons. Inning Appearances, Pitches, and Fatigue Units (starting from top left, and going clockwise. The first two graphs probably concern you – and that’s fine. He is throwing a lot more innings – and that is a risk factor – but what I’m trying to get at is that these innings are much less stressful on Joe. Looking at the days between his appearances, Biagini had an average of 2.83 days between appearances in 2016 (if you’re doing this math at home : if there is ever a period of greater than 10 days between appearances, I just removed it from the calculation). During the 2017 season – that’s up to 3.35 days between appearances, and in the past two months – he’s closer to six days between appearances (thanks to the new role). Joe has also become more efficient in 2017 – moving from an average of 16.6 pitches per inning in 2016 to 14.6 pitches per inning in 2017. A while ago, I wrote about how throwing more pitches per inning is likely the cause of more fatigue, and not total pitches per game – so, I was really happy to read this. Figure 2. Fatigue per inning, based on pitches per inning. Each line represents a 100 pitch start, divided between 4 – 9 inning appearance lengths. The moral of this story is: do not just think of an innings increase as a kiss of death for a pitcher – not all innings are created equal. 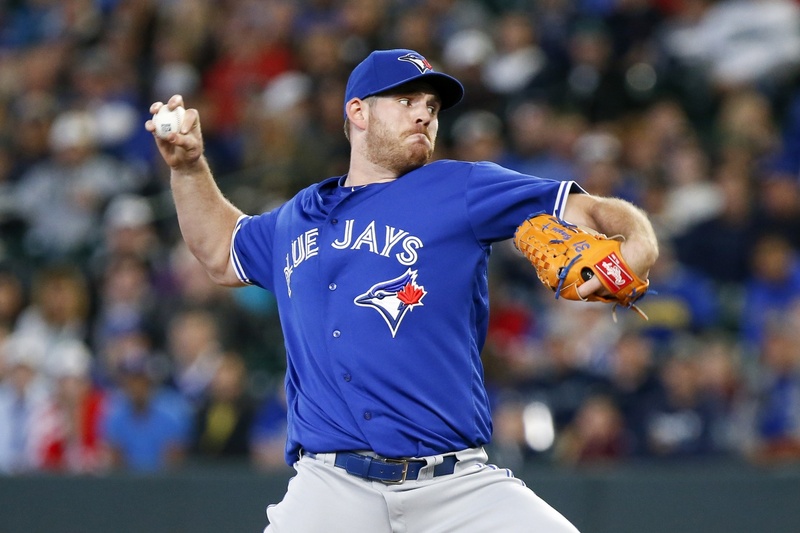 Giving Joe Biagini more time between his outings will help him out immensely when it comes to recovering – and remember: he has a starter’s pedigree. Instead of worrying about Biagini’s innings increase, go back to thanking the baseball gods that the Giants didn’t have room for him on their 40 man. Mike, interesting as always. My fear for Biagini has not been the move to the rotation, but the risk she if they throw him back in the pen and then impose a heavy workload there for the remainder of the season. I wouldn’t think that could be the worst of both worlds, as husband innings wouldn’t pile up and fatigue would escalate during 2nd half of the season. Given his value next season and after, I really hope they don’t move him back to the pen, as we know Gibby won’t be able to resist using him. James, you absolutely nailed it. This is my concern as well – I think there is not enough attention given to workload variability, and more so on absolute workload. Transitioning a pitcher in, and out of a role like that would be a HUGE concern for injury. I agree – I hope he stays in the rotation the rest of the season.